Cook pasta shells according to al dente package directions. Melt 2 tablespoons of butter in 12" skillet over medium heat on the stove top. Once butter is melted, whisk flour into skillet for approximately 2 minutes. Whisk in milk and cream, until there are no more lumps. Lower heat to medium low, continue to whisk for about 5 minutes or until mixture thickens. Stir in mustard, thyme, garlic powder, cayenne pepper, salt and ground black pepper. Whisk in cheeses and lemon juice, until the sauce is smooth and thick. Add warmed chicken stock, and mix until combined. 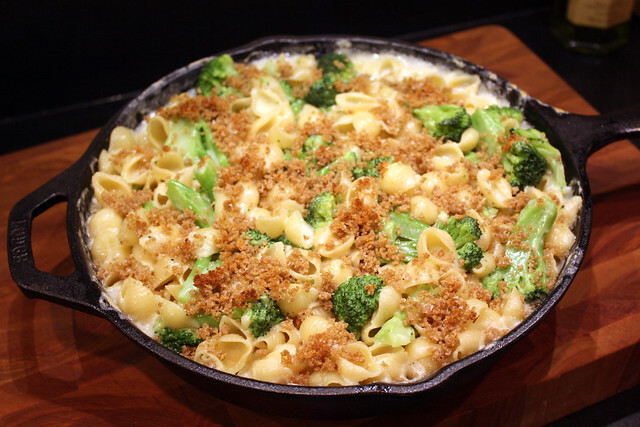 Fold in cooked pasta shells and broccoli. Sprinkle breadcrumbs on top. Break remaining tablespoons of butter into pieces and place on top of breadcrumbs. Place under broiler for about 3 to 5 minutes, until cheese starts to bubble and breadcrumbs brown.